(left) A newly constructed Portable Farms® Aquaponics System prior to planting or installing the fish in the fish tanks. 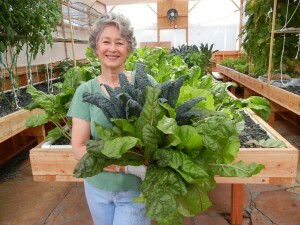 One head of tokyo bekana (a mild Asian green) and one head of Swiss Chard grown in Portable Farms® by Colle Davis, lead inventor, Portable Farms®. It only takes a few days to learn the areas related to assembling an aquaponics system so you can build your own Portable Farms® Aquaponics System! Aquaponics is easier and more productive than organic gardening or traditional agriculture and uses 95% less water. Portable Farms® Aquaponics Systems also use less electricity and less labor than any other aquaponics system in the world. Below is an outline of the 26 sections (A-Z) included in the Portable Farms® Aquaponics System Course© designed for training people to assemble, operate and raise healthy organic vegetables and aquatic animals (fish) in the Portable Farms® Aquaponics Systems through Aquaponics University, a wholly-owned training division of PFAS LLC. Section B: Explanation of the components that are incorporated into the aquaponics system for easy care. Restocking fish after harvest \Discussion for use of duck weed and suggestions and resources for raising duck weed for feeding fish. REFUND POLICY: Please note. You may ask for and receive a full refund of your tuition you begin the course because you will have access to the entire course curriculum. At the point, there will be no refund because you have received access to all our Intellectual Property. Is it possible to see pictures of the components that are included in the kit? Also, pictures of what is not included in the kit, with prices. I would like to see completed pictures of the size of what the kit Finnished product looks like. I am interested in building one however it is only my wife and myself what size do you recommend for 2 people? I want to take advantage of the sale but we are out of the country until November. We are both retired and on fixed income so think this may save us money. Rich: The contents of the Portable Farms Kit are available on our website. Provide your first name and email address on the second box/right panel of every page of our website. You can feed two people with a small grow table and fish tank. Hi, I’m from Malaysia. Is it possible to pay just for the course and not the kit? If so, how much would it be? Any chance you’d offer the Aquaponics University class in-person? I’m a high school teacher in New York City, and I’d love to combine the University with a visit to working aquaponic facilities next summer or in 2016. It would be more likely that travel and the cost of the AU might be something a granting organization would support more than just an online course. We’re in the early stages of having our roof certified for a greenhouse, but I can see this as the perfect direction for our science program. Thank you for the inquiry concerning the possibility of an in-person training. The Aquaponics University Course in now only offered as an email correspondence course. In the past we offered the AU Course at our Research Center and found the vast differences in learning styles and speeds reduced the effectiveness of the method so we no only offer the Course by email. Because the AU Course is Portable Farms® Aquaponics Systems technology specific in does not translate well to other aquaponics systems that are open source. There are now perhaps a half a dozen organizations that offer on-site training for general aquaponics and perhaps one or more of those would be better suited to your learning style. We trust this information is of some value to you. Good luck in all of your endeavors. The AU Course is an email correspondence course. The information is sent to you by email and you are tested on each section before the next set of sections are sent to you. We have students all over the world how have completed the AU Course. Most people take two to three weeks to complete the Course and upon satisfactory completion we send your the PFAS Kit. You will have to pay the postage and any customs for the PFAS Kit. The PFAS Kit containing the Portable Farms® Aquaponics Systems technology is only 30cm x30cm x 20cm and 7kilos in size. I want to take part in the course. But i am in china. So could you send me the PFAS Kit ? We do not sell to China and most of Southeast Asia due to Intellectual Property Rights violations. Sorry. I love your passion. A good looking ready to go kit is fantastic. Have you included in your course the California Fish and Game Laws and Licensing requirement for growing fish for food? I gave up on this idea as a home owner as the local contact here in Riverside County read from the code book, any fish to be consumed must be caught by hook and line unless produced as a commercial product and a commercial aquaponics license is cost prohibitive as it would include all sorts of hoops and reports to file. This is several years ago. So the CDFG may have different view on the matter. I am looking to relocate to Twentynine Palms area some time in the future, and due to soil, and environmental extremes I am re-thinking using this approach for my personal garden. (Of course I’d have plenty to share or use for barter). I am not a big fish eater as I prefer to get my proteins from beans and grains. So I am thinking of having my fish be “Ornamental” Koi perhaps if the CDFG can’t adjust to the backyard gardener harvesting their own fish to eat with a net. I have not purchased my cabin yet, do you suggest I get on District Water or old out for a piece of land with a Haul tank or well? How much water will be used in a small system per month in our hotter and dryer environment? One of the very first items we have people who have an interest in the PFAS is for them to check with Fish and Wildlife in their area about raising tilapia. If you are going to raise koi it is a moot question anyway. Under the extreme conditions of the area you are interested in locating the water usage for a small PFAS will be in the 40 to 50 gallons per day MAXIMUM. Not really an issue. Make your choice based on your needs and convenience. I am interested to know why you choose to use the grey gravel versus the clay balls I’ve seen others use for the grow bed. We will be taking the online course probably next fall. I really like your organized and well thought out approach. Thank you for the very kind words. The choice of gravel was made after experimentation with every kind of medium we could find. The clay balls do not support the plants well and are expensive. The gravel can be the least expensive locally obtained rock and it has to be cleaned exceptionally well. Will this system wok in Haiti where the day time temperature is from 85 to 105? Yes. The Portable Farms® Aquaponics System is always housed in a climatically adapted structure where the temperature is maintained between 45 and 104 degrees F. The use of vents and shade clothe prevent the temperature from exceeding the upper range. 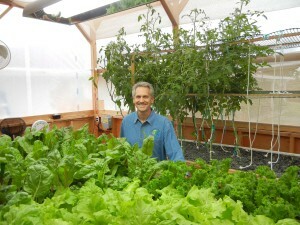 I’m looking to build out 10,000 square feet Greenhouse for Aquaponics by years end. I love your system and course offering and will consider taking the online class. Thank you for the kind words. Consider taking the course as soon as possible so you have a deep understanding of exactly what is required to be successful in commercial aquaponics. We look forward to having you as a student. Included in the 2500 aquaponics kit and certification classes? No. The AU Course includes the email correspondence course and the PFAS Kit. You will need to buy the materials to build the Grow Table, the AU Course shows you how, buy a Fish Tank and Clarifier drum and buy and build or have built the climatically adapted greenhouse. We suggest you build as large a greenhouse as you can afford so you can expand easily in the future. I am interested to learn about this aquaponics, can you let me know what else do I get besides the soft copies of the course. And what does one do when he wants to setup one 200sq ft portable farm in Toronto, Canada. I want to grow green chillies, mint, coriander, cucumber, tomatoes , cabbage, zucchini and okra. can I grow all of them for a family of four. Do I receive a physical object or is it just drawings and plans in the kit. The AU Course is an email correspondence course and you receive the PFAS Kit upon satisfactory completion of the Course. We will be placing a link to the PRICE LIST on this site. If you read the main site at , it gives you a much more indepth understanding the technology itself and what you can raise. HI ,I have been reading through your site for the last 3 days and it has me VERY interested in starting my own farm. Is there any way I can see (go to ) a working system before I commit to the whole kit -an -caboodle and the long term time, that a successful venture will require? The other question I have is what is the coast of additional kits once I have the 1st one running smoothly? I thank you in advance for any info you can give and also for ( IMO ) trying to educate people to a healthier ,cost affective way of getting food . There are currently no ‘public’ access systems because of the liability insurance issue. Portable Farms® Aquaponics Systems is not a concept, it is a proven system of aquaponics. We guarantee your system will work properly when you turn it on if you have followed the instructions we provide and we warrant all the components we provide in the PFAS Kit for one full year. If any component we supply fails in the first year, we replace it for FREE. You do have to pay the shipping to send the component back to us. On every page of the Portable Farms website on the right side there is a PRICE LIST request. Fill it in and up pops the price list covering all the components and the pricing structure for multiple PFAS Kits. We do not recommend a pond for the fish and water because it can not be heated and the water quality can not be controlled. This does not mean you can not use a pond, it means you cannot use the Portable Farms® Aquaponics Systems with a pond. Will it work in South of India where the winter temperatures are in the range of 15 to 20 Deg C and summers can be as high as 40 Deg C?. Do you any License holder for India?. Yes. The climatically adapted structure only needs to keep the temperature between 4 and 40 Deg C. There are several companies wanting the Territorial PFAS Technology License in India. None have brought forth the required credentials or money. You will receive a separate email covering the PFAS Licensing Fact Sheet. Please also look at our main website Portable Farms. We trust this information help you move your project forward. the 6 month time frame? The “Bill Me Later” is being offered by PayPal, not by our company. If you qualify for the “Bill Me Later” program, PFAS LLC (our company) will get paid upon that approval. Then as soon as those funds clear our system you can start the AU Course immediately. It is up to PayPal to decide if they want to extend the credit to you. We have no control over that business arrangement. It is strictly between you and the funding company. When you sign up, the process will pause while your credit worthiness is assessed and if they feel you are qualified then they will clear the transaction and PFAS LLC will receive the payment and you will be paying them ‘as agreed’ on some mutually agreeable time frame. We trust this addresses your question and we look forward to having you participate as a student. Thank you for your prompt relpy to my “Bill Me Later” using PayPal question. Yes your answer does give me the information I wanted. I will be signing up soon. You’re welcome, my pleasure. We look forward to having you as a student. I would like to use these systems in an urban environment. Is it possible to retrofit an old building? Yes, the Portable Farms® Aquaponics Systems are being used more and more in warehouses and large empty buildings. These installations obviously need to have grow lights and require more electricity. The trade off is the capital expense (building) is far lower even though the operating expense (electricity) will be much higher in an enclosed building. Often the buildings are virtually free, however the ongoing expenses will always be more than in a greenhouse because the free sunlight is not available. Each installation is unique and the cost/operating expenses can only be justified IF the local market will support the locally grown, pesticide free food being produced. I am a lady who is very much interested in being a commercial aquaponics farmer and would like to buy the Portable Farms since i have ead that they save water and easy manageable etc. I am therefore wondering if buying the portable farms is possible since i am in Botswana and maybe i can also be your agent here. Please respond since i have a piece of land for integrated farming and hydroponics and aquaponics has been part of my dream but just looking around for a better system which i have now found in yours. I am at the moment in a process of doing a business plan to submit to one of the financial institution here. Your response therefore will add value to my plans and the business plan. I have forwarded your request to the Botswana Country Portable Farms® Aquaponics Systems License Holder. His company is preparing for the public announcement of their grande opening which will be in the very near future. He will respond to you directly. I am interesting to involve this business and doing some feasibility. We are wondering where can we get the Tilapia from? I don’t think we have Tilapia in Mongolia. Could you please help us to provide some information? Tilapia can be shipped to most countries. Check with your local authorities and if the fish are allowed we will put you touch with breeders who can ship them to you. Your best bet is to purchase a breeding colony to keep up with your harvest of the fish. I went to order the PFAS online course and the website asked, “where would you like to ship.” This froze me for I thought the course was online. I work on a boat in the Gulf of Mexico and will not be at the house for another three weeks. I want to study the material during my off time on the boat. Please advise how I am to receive the course material. Also, I could not find the bill me later option when trying to pay for the course. Has this been dicontinued? The shipping address is necessary for two reason: 1: Billing address/shipping address because you billing and shipping address may be different and 2: More importantly to you, is we need to know where to ship your Diploma and the PFAS Kit. The AU Course material is supplied by email. The Bill-Me-Later option is on the PayPal website that pops up when you press the BUY Button. We trust this information helps. We look forward to having you as a student. Sure if you can find plants that love cold water and use someone else’s system. PFAS is specifically designed to keep fish and plants happy. Most plants do best at 73 degrees and trout like 60 or lower, not a good mix. A climatically adapted structure is required. Air conditioning is seldom required. What kind of fish can be used and does size become an issue? For example, red snapper can grow quite large, can that be used and at what size would it be harvested? You have not read the website or you would know that salt water fish are never used because plants do not like salt water. Size is not a problem. By doctor’s orders, I don’t eat flesh. Can this be done without eating the fish? Sure, simply name the fish and use koi, goldfish, carp or tilapia so you can enjoy their company and you don’t have to eat them. You need the fish poop or it becomes hydroponics. sorry if i missed this on an earlier page but is there a separate course for commercial farming and what are the details of the credentials of investors and market analysis that would be satisfactory to you. just crossing mt T’s and dotting my I’s. look forward to feeding many hungry mouths in my area. COMMERCIAL AU Course for Operators covers only the Operations, Maintenance and Healthy plants and fish sections. Operators of the COMMERCIAL installations do not need to know how to assemble the installations. The training for the Commercial Installers/assembly is done on site by a our site manager/foreman. His job is also to site train the new Operators who have already satisfactorily completed the online correspondences AU Operator Course. Your investors are vetted by you, not us. Your market survey and its potential are what your investors will be basing their financial judgements on concerning your project. Having a defined local market survey completed is the single most important step in the 5 Phases of Commercial Installations. Without it you will not know how large to make your first installations and what the potential for grow will be for your expansion. I trust this helps to clarify the difference between the AU Courses, the logic behind the differences and the process for capitalizing your project. How popular is Aquaponics in Florida where I live? The web traffic we receive has Florida in second place. This means that next to California, Florida has the most people interested in aquaponics. Our sites receive over 100,000 unique views each month and the number of Aquaponics University students is steadily increasing, Florida is again in second slot. Go on YouTube and search for ‘aquaponics’ and Florida, Hawaii and Australia are at the top of the list for numbers of submissions. Aquaponics is growing more popular every day in Florida. Hello there, I was just wondering if it is possible to buy the course notes with out the portable farm kit at a reduced price. I am asking you this because i live in Europe therefore i dont think its possible to ship the kit overseas or if you do it would be really expensive. I also wanted to ask you what exactly is included in the kit? The list of exactly what is included in the PFAS Kit and what is not, is available by requesting the PRICE LIST. On every page, right column, second box down. Email address, first name, SUBMIT and voila, up pops the price list. The PFAS Kit weighs approximately 7 kilos and costs approximately US$100 to ship to Europe. If you do not want the PFAS Kit, you will still pay the full price of the AU Course. Thank you for your inquiry into selling our PFAS in Nigeria. We already have a 600m2 installation in Lagos. If you can invest approximately US$200,000 we can have a discussion on placing a commercial unit in your area and helping you obtain a license for a territory within Nigeria. We do not sell the small units outside the US and Canada. If there is a License Holder in a country or territory, they are more than welcome to sell the smaller units. The License Holder in Lagos has chosen not to be on the sales side only the production of organic food. Please do let us know if this venture is within your realm of possibility. Please use the sign up form on this page. We very much look forward to working with you in your ventures. I have spent about 15 minutes trying to find the cost of the 8 people size kit and can’t find anything about it. Please let me know how much that is. The two links in the text box take you to the Aquaponics Course and the PFAS Kit page. The Portable Farms™ Aquaponics Systems Kit Option 2 is part of the course. If you only want the PFAS Kit Option 2 here is the page with that information. I am very much interested in starting up an aquaponics farm in Karachi, Pakistan. I have gone through your website in quite some detail but will need some more information. I am interested in doing the online course as well. Can you please give me details on that? By the way, I can also come to visit you in the US if you think that could help. Need information on getting the license as well. Thank you for your inquiry into aquaponics in Karachi, Pakistan. Completing the online course is the best way to start because it gives you the information you need to build and expand the systems. The details on the course are under “Commercial Course’ on the front page of this website. We are in the process of setting up a new commercial size demonstration installation in San Diego County and our plans are to have it available for tours the first week in June. It will be at our new headquarters and easily accessible for those traveling into Southern California. Please see Technology Licensing. We are rewriting the licensing process to be simpler and more lucrative for the License Holders. The rewrite should be done shortly before the new demo site is open to the public. I am very interested in obtaining the certification and to start the implementation of it , however the initial start up cost is a little much. Do you have any payment options for the certification? And if not is that something you would consider. We very much understand your concern. We suggest that you start putting money aside now and when you have enough to pay for the Certification Course in full, then start the course. IF we offered a payment plan, which we do not, you would not be able to start the course until it was fully paid for anyway. We have considered it and choose to not offer a payment plan at this time because it causes too many problems for everyone. I have a farmland of an acre outside lagos in Nigeria and already constructed 6 concrete ponds of 2m x 4m x 6m each for African cat fish production and 2 earth ponds 1m x 15m x 40m each for Tillapia production; The plan is that the waste water from the concrete ponds empties into the earth ponds. My question is; (A) Can i use the earth ponds for aquaponics? (B) Can the remaining land fit in for commercial purpose aquaponics and how. I am already registering for the course now. Thanks for sending me this E-mail as I have been searching the web for weeks now for this. Aquaponics is not popular in Nigeria(my part) as there are vast fertile soil here, hence i want to help spread this method of farming. Marcus Awoh- Macmed Intergrated Farms. We do not recommend earthen ponds for our systems because of pathogens from the soil getting into the grow beds. You can use the rest of the land for the most amazing grow beds you will ever see. I have also sent you a more complete response in a separate email. How long does the average student take to complete the commercial cource? The people who take the course are incredibly dedicated and most spend less than two weeks to complete the course. They literally work on the course every day so they have the information and can become certified. Plus the Commercial Course includes a PFAS Kit Option 2 so they can build their own immediately. I want to know all about your training?